My Art Collection 2.0 FAQ: What is the Tracking Number and How is it Used? What is the Tracking Number and How is it Used? The tracking number is for your own use, to be used as a numbering system. 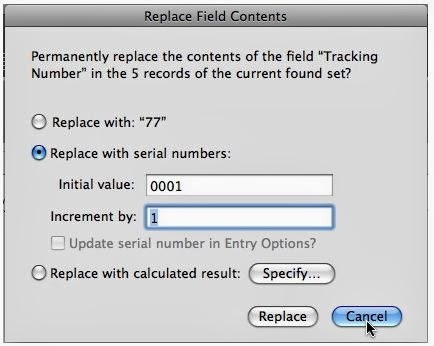 It defaults by placing a random unique number in that field upon record creation. However, you can type into the field and manually override the default number as you wish. If you are choosing to override with a sequential number, that is fine. If you choose to change a number and wish to update all records at once you can do that but not with a prefix such as, for example, "NYC", only with a sequential number. Please see the instructions below. Renumber all record's tracking number sequentially, automatically. 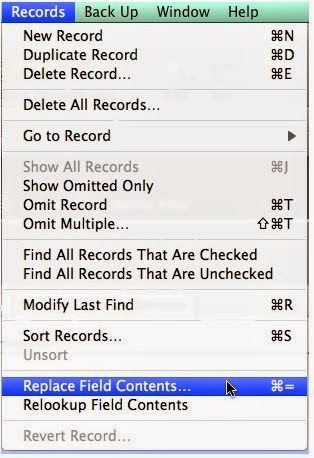 At the end of the inventory you can renumber all records sequentially, automatically, by putting your curser in the Tracking # of the FIRST record and going to Records/Replace Field Contents in the upper menu bar. Remember to hit the Show All Records button or go to Records/Show All Records to make sure all records are currently displayed. 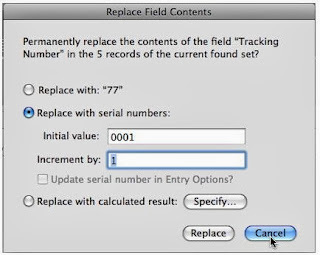 When the dialog pops up, choose the "Replace with serial numbers:" option, make your choice of how long your number will be and click Replace. This will serialize all records in your art list at once automatically. 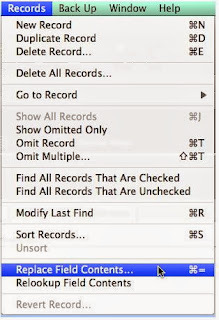 If you add new records later just insert manually at the next sequential serial number.